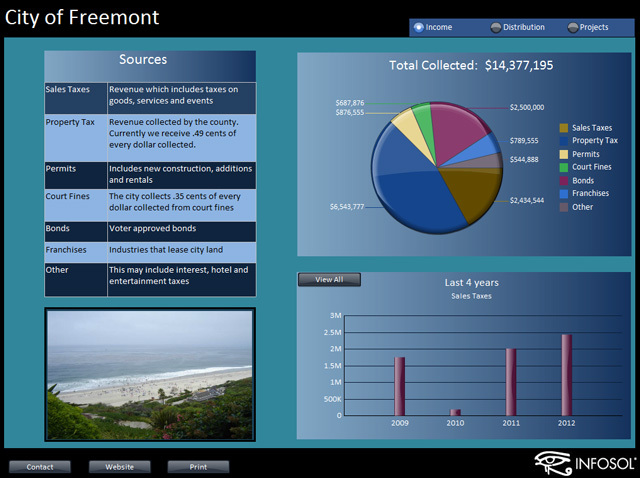 The Public Sector dashboard provides an overview of sources of income, distribution by department and special projects in the fictional City of Freemont. The dashboard landing page shows a summary of different income sources such as Sales Taxes, Property Tax, Permits, etc., along with a brief description. The pie chart shows the total income amount for each of the sources. Clicking on a pie segment updates the bar chart on the bottom right of the screen, showing a breakdown for that category over the last four years. 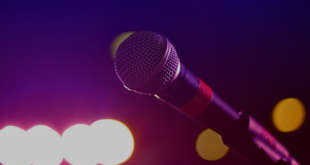 Clicking the View All button below the pie chart changes the bar chart to a line chart with controls that allow you to select and deselect radio buttons to remove or include data for the last 4 years. The slider below the line chart allows Jerry to control the number of categories displayed in the line chart. Clicking the Distribution radio button on the top right of the dashboard opens a page showing a breakdown of spending by department. The distribution canvas includes a slideshow that can be started, paused and manually operated using the controls at the bottom of the screen. The slides provide detailed information and interactive options for Public Safety, Schools, City Government and Library System. For example, the Public Safety slide in the slideshow provides a breakdown of spending in the police and fire departments. The horizontal bar chart on the left shows the amounts spent in different categories. Clicking on the Personnel bar updates the column chart to the right, showing Personnel costs in the police and fire departments. Hovering your cursor over the bar shows the exact amount spent. Clicking on the Projects radio button provides information about different projects taking place in city of Freemont. The Parks page shows the total amount allocated to Parks projects, and summarizes the four projects that are under way. 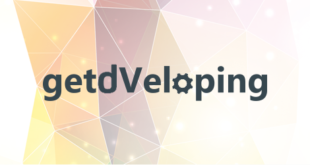 The progress bars for each project provide a detailed breakdown of the amount spent against the amount allocated to that project, as well as the % complete. Using an algorithm that is unique to each project, the amount spent is compared to the % of Project Completed, which drives the color of the indicator. For example, the Central Park indicator is coded yellow because $67,512.33 of the $230,035.12 budget has been spent, but the project is only 25% complete. Hovering over the yellow indicator shows that the project is $10,003.45 over budget. Hovering over the green indicators shows that the project is on budget. Clicking on the Police tab highlights two projects with a focus on crime reduction. Similarly, the Roads tab shows four different projects aimed at road improvements in the City of Freemont.